The Cambridge Primary Review Research Surveys is the outcome of the Cambridge Primary Review – England’s biggest enquiry into primary education for over forty years. Fully independent of government, it was launched in 2006 to investigate the condition and future of primary education at a time of change and uncertainty and after two decades of almost uninterrupted reform. Ranging over ten broad themes and drawing on a vast array of evidence, the Review published thiry-one interim reports, including twenty-eight surveys of published research, provoking media headlines and public debate, before presenting its final report and recommendations. policy frameworks: governance, funding, reform and quality assurance. 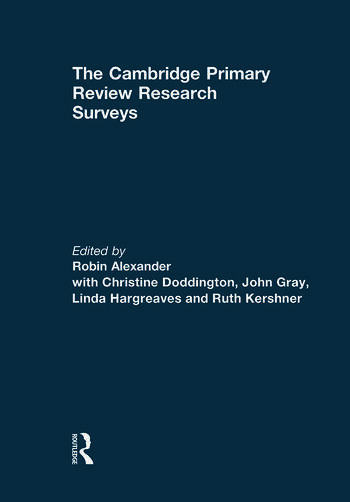 The Cambridge Primary Review Research Surveys is an essential reference tool for professionals, researchers, students and policy-makers working in the fields of early years, primary and secondary education. Robin Alexander is Lead Director of The Primary Review, Fellow of Wolfson College at the University of Cambridge, Professor of Education Emeritus at the University of Warwick and President of the British Association for Interntational and Comparative Education. Christine Doddington is Senior Lecturer in Education at the Faculty of Education, University of Cambridge. John Gray is Professor of Education at the Faculty of Education, University of Cambridge. Linda Hargreaves is Reader in Education at the Faculty of Education, University of Cambridge. Ruth Kershner is Lecturer in Psychology of Education and Primary Education at the Faculty of Education, University of Cambridge.